We've introduced some improvements to filtering on the Analytics page. 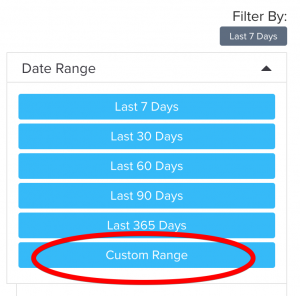 These changes include the new ability to filter analytics by custom date ranges. Where can I see these changes? You can find the improved filters in the upper-right corner on the analytics page. You can now filter by a range of dates or by groups. Your currently applied filters will appear above the two dropdowns. Clicking on the “Date Range” button will reveal several date range filtering options. There are several quick filtering options for the last 7, 30, 60, 90 or 365 days. 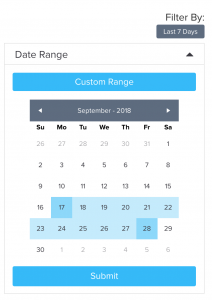 To filter by a custom date range, click “Custom Range”. A calendar will appear with dates to choose from. 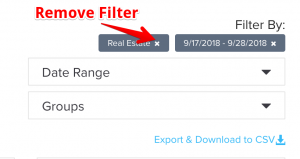 Select a start date and an end date from the calendar for your filter by clicking on two dates. Click “Submit” to apply your date range filter. Once you’ve applied a filter, you will see a list of applied filters above the two filters dropdowns. To remove any of these filters, click the “x” close button next to the filter name. Removing a date range will return the analytics results to the default of “Last 7 days”. We hope you’re as excited as we are for this new feature! If you have any questions, you can always reach out in support within Clearview Social, or send us an email at support@clearviewsocial.com.